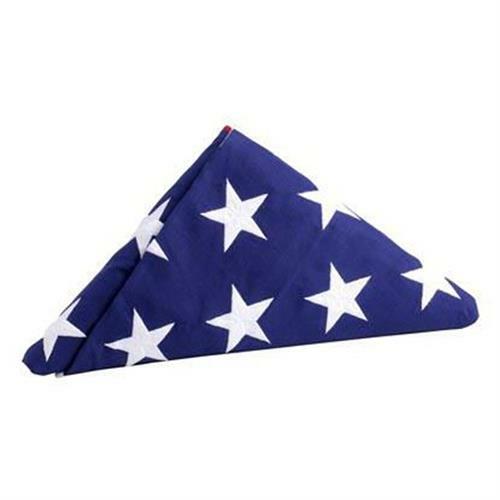 USA COTTON INTERMENT CASKET FLAG 5 FT X 9.5 FT , for burial services, MADE IN THE USA. Flag is folded for shipping in a square. All sewn stars and stripes.Traditional Casket Memorial flag used at Veteran memorial Services. God Bless all our Veterans. Our USA COTTON CASKET INTERMENT 5X 9.5 FT FLAG. Our cotton interment memorial casket flags are the official flag used by by veterans , funeral homes, and the military. All stars are embroidered. Double stitched throughout, with fly end secured with six rows of lock stitching. All sewn cotton stripes. Our flag is Made in the USA. It is a beautiful flag to remember your veteran. American Flag BEST Cotton Flag 4 ft x 6 ft, Made in the USA, by Valley Forge Flag Co. Embroidered stars and sewn stripes, traditional cotton flag. USA BEST COTTON FLAG 5 ft x 8 ft, all sewn, MADE IN THE USA by Valley Forge Flag Co. Embroidered stars and sewn stripes, lock stitched 4 rows.